By way of introducing myself, I am Barbara Smith, a life-long California history buff and founder of the docent program at historic Mountain View Cemetery in Oakland, CA, where Charles Crocker is buried. 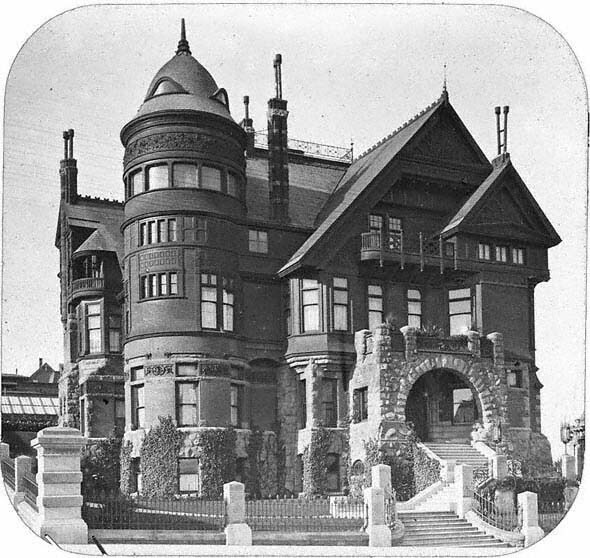 ... one of your photos is mislabeled ... the glass plate image of what is labeled as Charles Crocker's San Francisco house. Actually, it is his son William's house built sometime after Charles Crocker's 1888 death, on the lot next to the Charles Crocker home. After both houses were destroyed in the 1906 earthquake/fire, William Crocker gave both lots to the Episcopal Diocese as the site of Grace Cathedral. The property faces on California Street and is bounded by Jones, Sacramento, and Taylor Streets. The following link will take you to a picture of Charles Crocker's house taken about 1878. Charles Crocker's house is the great dark pile at the upper left in the photo. The adjoining property which was to become the site of William's house is the upward-sloping lot behind Crocker's house – obviously a great deal of grading was done before William's house was built, as the entire property is quite level today. William Crocker apparently liked the iron fencing around his father's property, as he installed the identical fencing around his house. A note of interest, in the photograph of the Charles Crocker house, you will note a high wooden barrier that appears to grow out of the white house located in the center of the photograph. Actually, that is the 40' high "Spite Fence" Charles Crocker built around three sides of the property of one Nicholas Yung, a German undertaker who refused to sell his property to Crocker. Mr. Young could then see out only through his front windows! The white house next to Crocker's was built by the CPRR's David D. Colton, and after his death was owned by Collis P. Huntington – now the site of Huntington Park. I enjoyed looking at your website. "No. 13375 Cal. San Francisco, Residence of Crocker Railway magnate." Image and Caption courtesy John Fillmore.